We are super excited to announce that facials will be available at the Healing Waters Spa starting May 6th. Pricing: 25 min for $65 (pairs nicely with any massage) and 50 min for $120. Look for our new menu on May 1st. Call 800-594-0178 to book today. Below is a new facial being added to our menu that offers radiance and will make your skin look and feel brand new! Youthful skin renews itself constantly but over time, healthy cell turnover slows dramatically. The result is visibly aging skin. Your original, beautiful skin doesn’t need to be a thing of the past. Experience this nurturing facial treatment with organic cellular renewal products combined with a comforting facial massage from a Reiki Master Esthetician. Soothing Sound Therapy is utilized to further aid in your healing process. 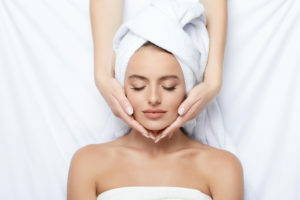 This one of a kind facial allows you to receive exactly what your body, mind, and soul need to repair itself on the outside as well as the inside.